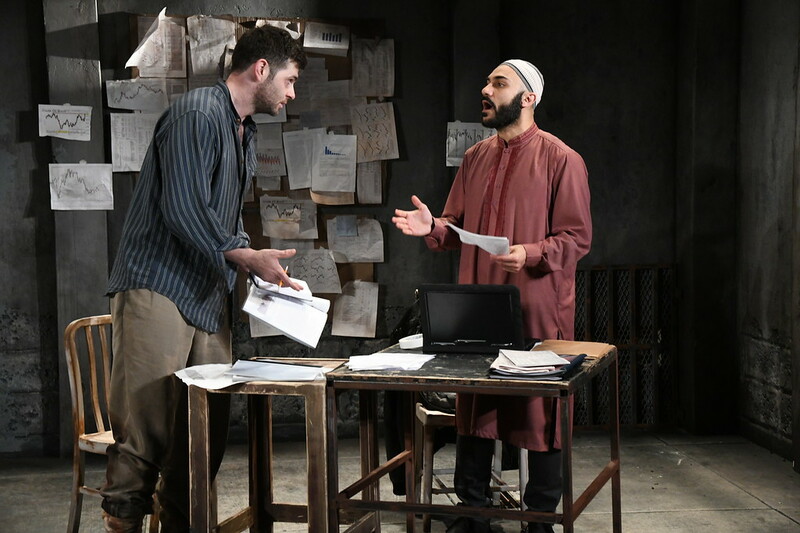 Thomas Keegan and Maboud Ebrahimzadeh as Nick Bright and Bashir in THE INVISIBLE HAND at Olney Theatre Center. (Photo: Stan Barouh). Clash. This is a story of clashes—between cultures, between values, between religions, between the haves and have-nots. It is not an easy play, nor is it comfortable for the audience. It asks a lot of questions about violence, capitalism, moral authority, and falling from grace. It asks, is it even possible to be moral in a world where so few have the means to have that luxury on a consistent basis. It asks us to consider responsibility and unintended consequences. It wonders about bias—conscious and unconscious. The questions it asks are not particularly new, but they are placed in stark relief in the setting of this play. Maboud Ebrahimzadeh plays Bashir…fresh and solid and eviscerating. Directed by Michael Bloom, “The Invisible Hand,” now playing at the Olney Theatre Center, takes place now in an unnamed town in Pakistan, where a banker with an international bank has been kidnapped and held for ransom. Actually, the wrong guy was kidnapped—it was supposed to be his boss. He has been kidnapped by one of a number of militia groups in the country who is trying to maintain order in their own tribal region. The ransom demands are not being met, either by his company nor the United States government. Finally, in desperation, he offers to delve into the Pakistan stock exchange to earn the money for his freedom. After some initial hesitation by the leader of the group, he is allowed to do so, but only under the supervision of one of the leader’s right-hand man, whom he is to teach what he knows. And he is never allowed to actually touch the computer—only the right-hand man can do that. Maboud Ebrahimzadeh plays Bashir, the right-hand man. He gives a performance that can send chills down your spine—not so much for the rare instances of violence—but for the complete portrayal of a man so conflicted and so desperate to believe in the rightness of his cause that he practically vibrates at times. Ebrahimzadeh has played the part before and won the Barrymore Award for Oustanding Lead Actor in a Play, but his portrayal at Olney was fresh and solid and eviscerating. As the unfortunate American banker Nick Bright, Thomas Keegan has the difficult task of humanizing a character that seems more an archetype of the ugly American. The character vacillates between tearful despair and cringing terror over his possible fate and then on a dime turns into a domineering and impatient master of the universe type. When he is subject to some physical abuse, he tries to run and hide, cowers and cringes, and begs for his life. That seems reasonable when a man who has never seemingly faced any type of physical hardship is tested, but there is zero introspection or growth of any kind. It’s not an easy role given its limitations and for the most part Keegan masters the portrayal of an unreflective, one-dimensional man. Dar (Ahmad Kamal) is a foot soldier for this militia. His lower standing is shown in little things—for example, he has a flip phone while Bashir has an iPhone. When he is given $100 by Bashir, he is admonished to use half for himself and his family and give half to charity. It is indicative of the way that he is treated as a simple man who can only understand simple things. Recently seen at Signature Theatre in the title role in ‘4,380 Nights,’ Kamal gives a solid performance, albeit in a role that again seems the archetype of the simple man as the truth-speaker. The Imam Saleem is portrayed as Mueen Jahan. In some respects this is the most troubling role; there are signs early in the proceedings that he is not a wise teacher or holy man, but a man risen to his incompetence level in the position as leader of this militia group. Will he be corrupted? Yes. Does he use physical abuse against those serving under him? Yes. Will he attempt to blame others for not thinking things through? Yes. Jahan does imbue him with a kind of quiet desperation under his all-knowing pronouncements, but in the end, he’s basically a bad boss that too many will be familiar with. Scenic Designer Luciana Stecconi and Costumer Designer Ivania Stack both deserve special mention for their respective efforts. The prison cell where all the action takes place is rendered in beautiful detail; one can almost smell the despair and sweat in the walls. The costumes are designed to give a sense of each man’s place in the hierarchy, as well as a sense of their socio-economic status. Bloom’s pacing is brisk and he uses lighting and sound to great effect. At night, when Nick is trying to loosen the grout between the stones in the wall behind his bed to try to effect an escape, the sound ratchets up the tension—will he be heard? Can he escape? And if he escapes, where and how will he find safety? It brings home like a gut punch the reality of the situation and is a masterful detail. “The Invisible Hand” was written by Ayad Akhtar, who is the author of the 2013 Pulitzer Prize-winning play, “Disgraced.” This work was nominated for the ATCA/Steinberg Award and won Best New Work 2013 from the St. Louis Theater Critics Circle. As a young man just starting out on his career, he moved to New York with his father’s support and one condition—that he read the Wall Street Journal every day. He fulfilled that condition and continues to read the WSJ every day. This grounding in the “real world” (the words of his father) inform the very heart of this work. “The Invisible Hand” runs from May 9 – June 10, 2018, at Olney Theatre Center, Olney, MD. For more information, please click here.